The 30,000-year-old horse bone found in the Peace River Valley by Shawn Bigfoot. A bone found in the Peace Valley River region of British Columbia, Canada, has been confirmed as being from a 30,000-year-old extinct species of horse. The bone was found by Shawn Bigfoot, a Prophet River First Nation member, around a gravel pit along the banks of the river. At first, he was unsure of what he found. She decided to take the bone to Treaty 8 Tribal Association to see if it could be identified. 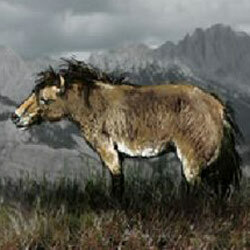 The prehistoric Yukon horse would have been frequenting the Peace River Valley around the beginning of the last Ice Age. Confirmation of the age of the bone and its species was established through radio carbon dating and analysis with the assistance of archaeologist Jon Driver, from Simon Fraser University. The Peace River Valley is a region of significance to the local First Nations inhabitants, who have lived in the area for at least 500 generations. It is said to be home to First Nations archaeological deposits and cultural sites that date back to the end of the last Ice Age. The Peace River originates in the Rocky Mountains of northern British Columbia and flows to the northeast through northern Alberta. The tribal association says the river supports fragile ecosystems, with many members opposing plans for a new hydro-electric dam on the river in British Columbia. The Yukon horse was relatively small, standing just over 1 metre at the shoulder. It thrived in a steppe grassland environment and was among the most common of the Ice Age animals in Alaska and the Yukon. Image: © SFU Museum of Archaeology and Ethnology, 2005.